Captain Charles Moore grew up on the Pacific Ocean, sailing from a young age. He founded the Algalita Marine Research Institute in 1994 “to protect and restore the marine environment.” In 1997 his research focus turned after he charted an ocean course through the North Pacific Gyre and discovered “The Great Pacific Garbage Patch”—an enormous floating vortex of plastic debris and trash. Despite its size and density, this patch is not visible by satellite photography or as a continuous debris field to the human eye. Algalita helped develop protocols for monitoring marine and beach micro-plastics that are now in use worldwide. 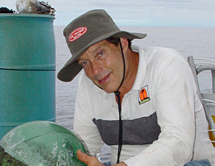 His over 100,000 miles of research voyages and significant media attention that his published papers generated have helped us better understand the magnitude of our plastic “footprint” and its dangerous impacts to fish and human health. His work has inspired dozens of activist groups and civic movements to reduce plastic waste at its source. His book, Plastic Ocean was published in 2010.